Alternatively, you may use the form below to request our staff assist you in finding the information. This is a departmental disclaimer. Also see the Pima County Disclaimer that pertains to Pima County websites as a whole. All information, web pages, data (including digital data), maps, programs, software, studies, reports, patents, copyrights and plans obtained by and prepared for and by the Pima County Regional Wastewater Reclamation Department (hereafter "Products") shall remain the property of Pima County. It is expressly understood that Pima County (hereafter "County") has exclusive control of all information developed for this work. Any for-value use of Products shall be retained by the County and negotiated for use by the Pima County Regional Wastewater Reclamation Department. Requestor agrees that any misappropriation or misuse of the Products will cause serious damage to the County and that, because money damages may not constitute sufficient compensation, any misappropriation or misuse shall justify and allow the County to apply to any court having jurisdiction for an injunction or other proper relief and, if relief is granted, the County shall be entitled to the reasonable expenses of the action including attorney’s fees. Products are for illustration purposes only and are not suitable for site-specific decision making AND ARE SPECIFICALLY NOT SUITABLE FOR BLUE STAKE PURPOSES. Products have not been prepared for and are not suitable for engineering, or surveying purposes. Generally, Products do not represent on-the-ground surveys and rather represent the approximate relative location of boundaries and features. Use of Products as an engineering tool is expressly forbidden. Products should not be used for making financial or any other commitments. The County provides these Products with the understanding that they are not guaranteed to be accurate, correct or complete and conclusions drawn from the Products are the responsibility of the User. While every effort has been made to ensure the accuracy, correctness and timeliness of materials presented anywhere within the Products, the County assumes no responsibility for errors or omissions, even if the County is advised of the possibility of such damage. When logotypes are provided with Products, they shall be clearly displayed on all copies or reproductions of the Products or parts of the Products. 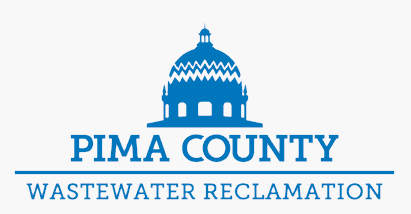 The Pima County Regional Wastewater Reclamation Department logotype on the Products shall not be removed or obscured. These logotypes should not be added to derivative products you develop. the following addresses below have a valid sewer connection. information is provided as is and without warranty of any kind.